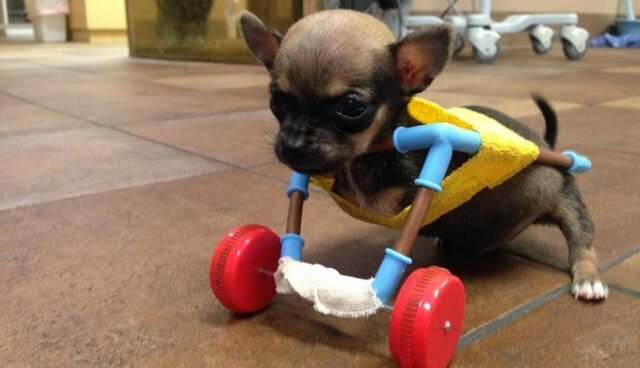 A tiny disabled puppy named Turbo has been given a new lease on life, and a stylish set of wheels too boot, all thanks to the ingenuity of veterinarians who refused to consider him just another lost cause. 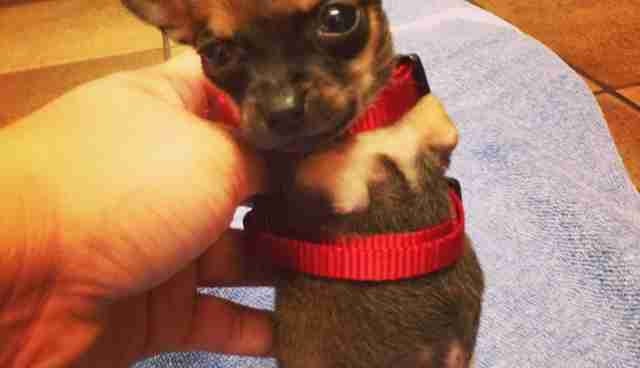 The one-month-old chihuahua had been born with two undeveloped limbs, making it all but impossible for him to get around on his own or to compete with his siblings when it came time to nurse. Eventually, Turbo's owners decided it would be best to surrender him into the caring hands of veterinarians, but they were turned away several times by clinics who said that there was nothing they could do to help. Most recommended that the little dog be put down instead. Thankfully, the couple finally found someone else who agreed that Turbo was worth saving. When Amy Birk, manager of The Downtown Veterinarian in Indianapolis, first saw Turbo come through the door, she knew euthanizing him wasn't an option. Aside from his missing front legs, he was a happy and healthy dog, and there were ways she knew that he could be helped. "A small dog can do well with a cart. So, unless he had another medical condition, there was no way we were putting him to sleep," Birk told the Indy Channel. Because he is so small, however, Birk soon found that there weren't any carts out there that would fit him, so she and her staff got creative. Using a harness designed for ferrets, some pipes from a toy welding kit, and the wheels from a Fisher Price helicopter, they custom-designed a mobility cart just to fit Turbo's tiny frame. And sure enough, it's doing the trick, helping the disabled dog enjoy his puppyhood to the fullest, despite the challenges of his disability. "He's very much a typical Chihuahua," says Birk. "He's rowdy and loves to play and will attack your shoe." Turbo's life is set to improve in other ways as well; Birk says that offers have been pouring in from folks who would be happy to welcome him in their homes.